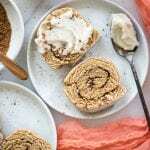 Easy Cinnamon Rolls: I’m all about easy, aren’t you?? Ditch the yeast, rising of the dough and complicated recipe instructions and make these Simple Mills Cinnamon Rolls for Easter this year. This post has been sponsored by Simple Mills. All thoughts and opinions are my own. Thank you for supporting the brands that keep Kroll’s Korner running! What’s even better about these cinnamon rolls is that they are made with pancake mix. Not just any pancake mix either. I’m using the Simple Mills Pancake and Waffle Almond Flour mix to whip these bad boys up. (Or should I say “roll” these bad boys up), ha! This mix is made with a delicious blend of almond flour, coconut flour and coconut sugar for nutrient value. I love finding products like this that have healthy & wholesome ingredients AND delicious taste. Coconut flour/almond flour or gluten free flour for dusting your surface before rolling. 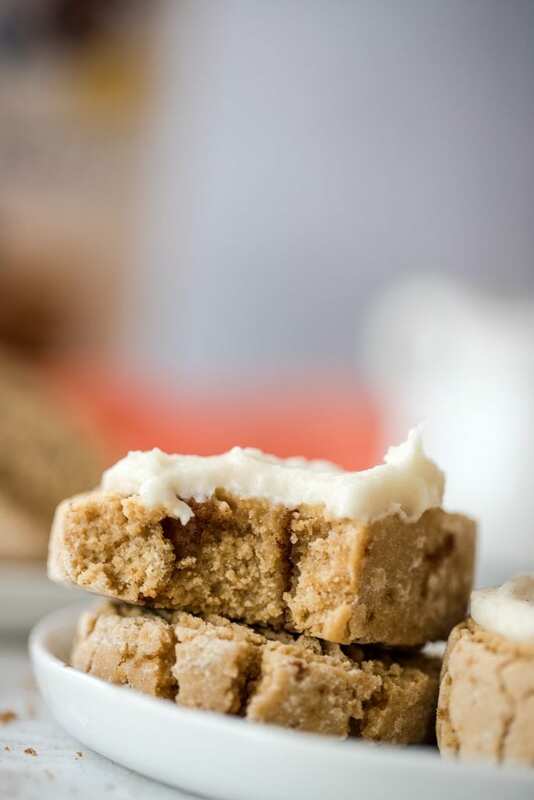 All of the ingredients in this recipe are recognizable and simple. 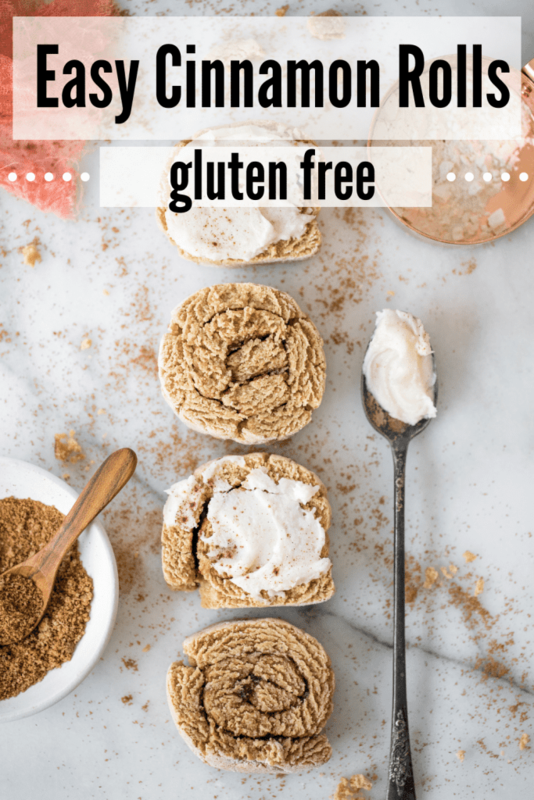 The pancake mix also has a recognizable ingredient list as well: Almond Flour, Arrowroot, Organic Coconut Sugar, Organic Coconut Flour, Cream of Tartar, Baking Soda, Sea Salt. I love how Simple Mills handpicks their ingredients with a purpose and chooses ingredients to nourish us. As a Dietitian, that is one of my top priorities so I appreciate their vision and aim to enrich lives and bodies through real foods. Before you read on, be sure to watch this video I made on how simple and easy it easy to make these cinnamon rolls. No, seriously…go give it a watch! Just 1 minute long! Pro tip: You’ll want to knead it like regular dough for about 3-4 minutes! This is key for the cinnamon rolls to maintain a great texture. You’ll place the Simple Mills pancake mixture in a bowl and stir in the milk. Pour the dough out onto a floured surface and begin to knead the dough. Shape it into a rough ball and then knead until the dough is nicely incorporated. (Knead by gently pressing the dough down and away from you with the heel of your hand). Press out into a long rectangle, spread softened butter on top followed by the brown sugar/cinnamon mixture. Gently roll the dough into a log and use floss to get a clean cut for each cinnamon roll. Then bake away! Easy peasy! One of my favorite Easter memories is enjoying brunch with the family. Long hours spent around food in the kitchen and having a nice time. 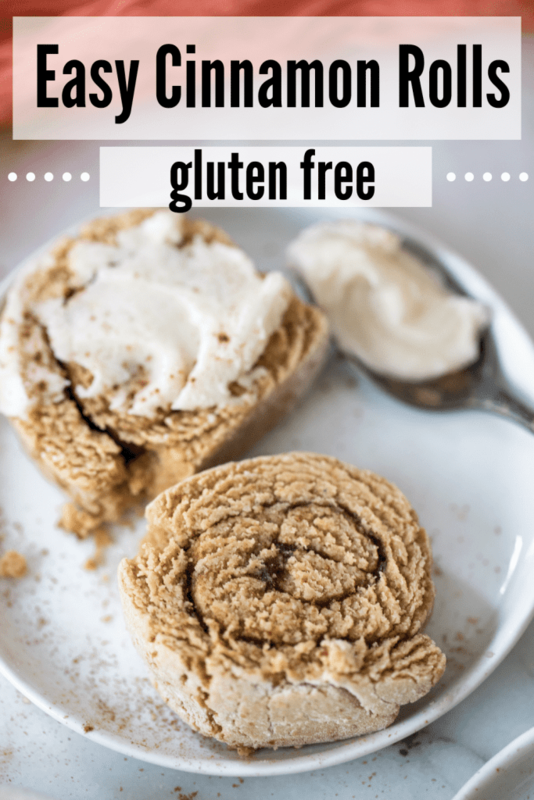 If you plan on doing the same this Easter and need an item to bring, these cinnamon rolls are it! I hope you enjoy this recipe! Be sure to tag @krolls_korner on Instagram if you make this recipe so I can see your photo! Preheat oven to 350 degrees F. In a medium bowl, mix the Simple Mills pancake mixture with the milk. Press out into a long rectangle, spread the softened butter on top of the dough followed by the brown sugar/cinnamon mixture. Spread evenly across, using your fingers. 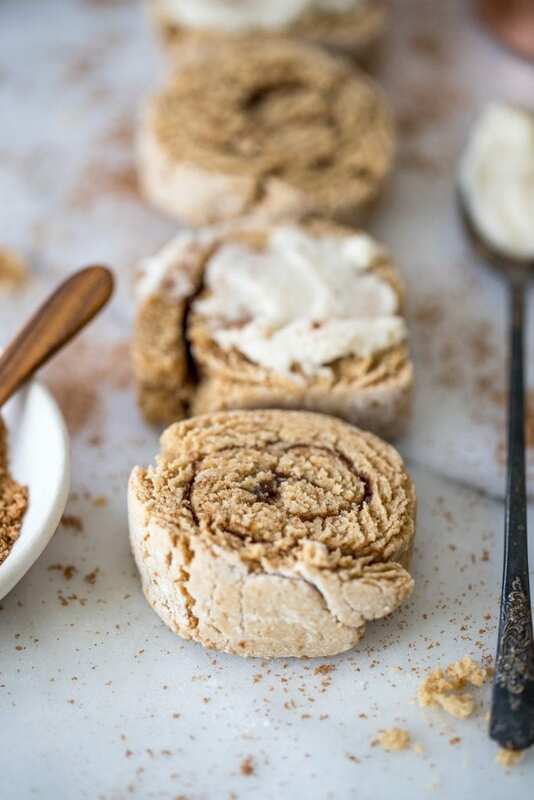 PIN THIS EASY CINNAMON ROLLS FOR LATER! Wow! This is such a great idea! I have always had cinnamon rolls on my to do list, but they are so much work! I can’t wait to try your version! Thank you so much – hope you love them!! These are exactly what I need! I’m always craving cinnamon rolls but definitely not up for doing all the work usually needed to make them, especially in the morning. They look amazing! Anything that makes getting cinnamon rolls into my mouth easier and faster is 10/10 for me! I can’t wait to give your recipe a try! Haha, I 100% agree!! Thank you! It’s been so long since I made cinnamon rolls. Too long! This recipe has me anxious to make them soon. Long overdue!! 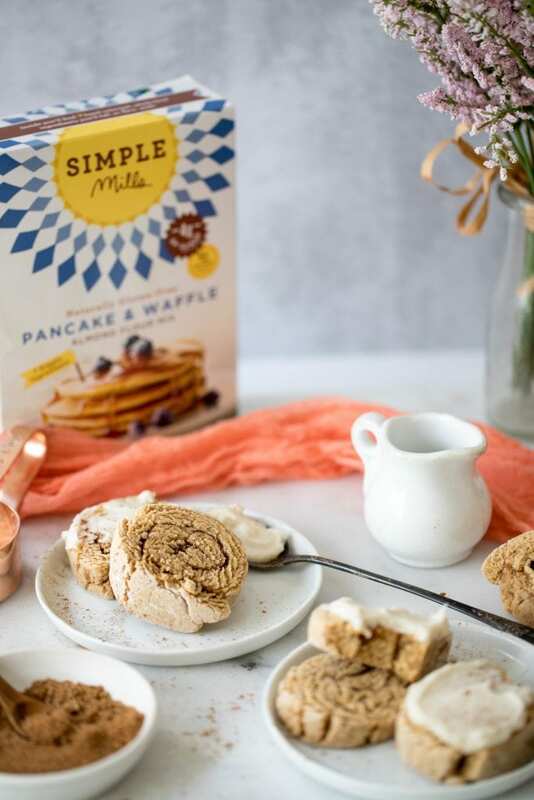 Hope you love this easy recipe with Simple Mills! !